I’d like to write about two individuals who have been friends, professional colleagues or more. Sadly both have died, one over a decade ago, the other just a year ago, but I would like to add my own tribute to their lives and give a few anecdotes about them. The first is Dr Peter Hansell. In medical photography terms, Peter Hansell was one of the greats. 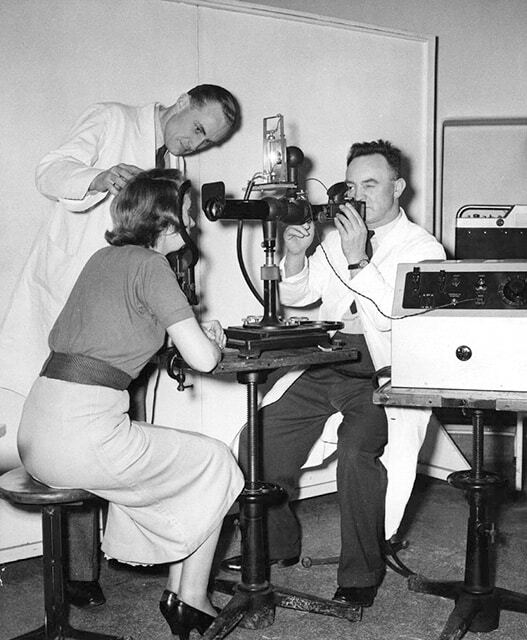 He is credited with founding the first true department of medical photography at Westminster Hospital and Medical School in 1948 (I think) which is when the NHS was first formed. Peter was a medic himself – given the Fellowship of the Royal College of Physicians in later life – but was a very keen photographer and set up a department within the hospital. My own relationship with Peter started a little while after I entered in the profession in 1979. I had been employed as a trainee in a specialist ENT department in London and started my City & Guilds 745 photography course at Paddington College on a day-release basis. At that time, this was “the” course to do for aspiring medical photographers and spanned three years. It was quite an intensive course, where you learned photographic chemistry, optics, physics, filters, how to handle a 5×4-inch camera, as well as medium format and 35mm and how to read a Weston light meter correctly. I doubt that any of these skills are taught now. 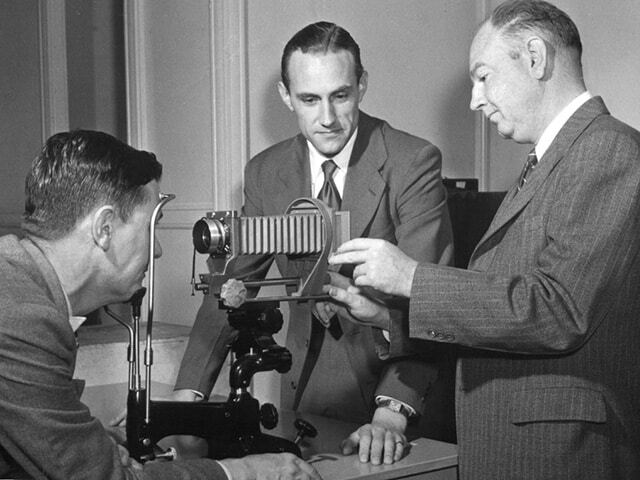 Peter Hansell (standing) with photographer Nyfed (Jeff) Jefferies using an ophthalmic camera. Having been at the specialist unit for 18 months, I applied for a post as a basic grade photographer at Queen Mary’s Hospital in Roehampton and was given an interview. I put together a few sample images that I had from the work I was currently doing, as well as some images from my college work and went along to be interviewed. Nervous? Very. Peter Hansell was on the interviewing panel. I knew of him, but had never met. He was an imposing man – quite tall and well-built and with a very direct gaze and asked searching questions. I cannot remember any of the other members of the panel and have no recollection of how I did at all, except that I walked away feeling that I had not done as well as I wanted. I received a phone call from Peter Hansell that evening. This in itself was unusual, as I never received any call from the hospital staff on the panel, only Peter. He told me that I was not going to be offered the job at Roehampton but that he wanted to offer me another post, that of running my own one-man department at St Mary Abbott’s Hospital in Kensington and was I interested? Was I interested? Daft question, of course I was; you don’t get opportunities like that very often. It turned out that St Mary Abbott’s Hospital operated alongside St Stephen’s Hospital in Chelsea and the photographic department served both locations. They were also part of the Charing Cross and Westminster Medical School campus – hence Peter Hansell’s connection with them. The previous photographer, whom I never met, had departed and the post was vacant. I served my notice at my current job and went to St Mary Abbott’s. It was a good place to work, though the constant travelling between there and St Stephen’s was inconvenient, especially as the vast majority of the patients were at the St Stephen’s (Fulham Road) site and I was spending two or more hours a day making the round trip, which was hugely inefficient. With backing from Peter Hansell and Keith Duguid, the chief photographer at the Westminster Hospital, my department was rehoused at St Stephen’s Hospital and I grew the service there over the next few years. Peter Hansell moved from being just my Director to being a good friend and adviser. His reputation was legendary. He had very high standards and expected all his staff in all the various departments over which he held authority to maintain those standards and to publish papers on ideas, techniques and procedures. 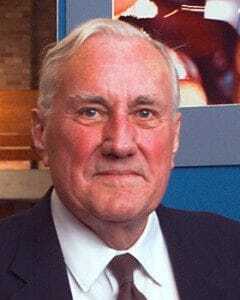 He had been one of the original editors of ‘Medical & Biological Illustration‘ and other members of his staff at Westminster Hospital – Richard Morton, Keith Duguid and Jeremy Nayler – were also later editors. Peter had a couple of characteristics which I am sure will be familiar to those who knew him well. One was his gaze, which I mentioned above. His eye contact was quite intense and he held other people’s gaze quite firmly while in conversation. The other was that he often paused before responding to a question or while in a discussion. This is quite rare these days – I find that people often answer quickly and interrupt frequently – but Peter Hansell was of the generation who gave you the respect of listening while you spoke and then answered and continued the discussion or debate. This was fine in face-to-face discourse but when speaking on the phone there could often be a pause of many seconds before he replied. The first few times that this happened I found myself speaking too much – qualifying what I had just said or asked, adding more (often irrelevant) detail, believing that Peter either had not understood what I had said or that I needed to justify my side of the conversation. In time I learned to say my piece and then wait. After a pause, Peter would reply and the conversation would progress, but you could never hurry the process. Peter Hansell with H. Lou Gibson (seated, left) and [Capt.] Charles G. Brownell [US Army, retired] (standing, right). They are using the Kennedy Monobar camera. Exact picture date is unknown, probably early 1950s. And – dammit – he was so insightful. I found his thinking to be rock solid and the one time that I ignored his advice – which was not to make a certain move later in my career – he was, in time, proved absolutely correct in his assessment of the situation. My mistake. In 1979 Peter published his ‘Handbook of Medical Photography‘ and I bought my own copy, which Peter signed for me. Somehow – I really cannot remember how – I mislaid it. I can’t remember if it got lost in my later moves or if I loaned it and never received it back. However, I decided to make efforts to replace it, the only problem being that copies of this book are now extremely rare. Peter had died at the beginning of this century (2002) but I decided to go as close to the source as possible. I had met Peter’s wife, Jean (also a doctor) a number of times and always found her to be welcoming, excellent company and a very entertaining hostess. 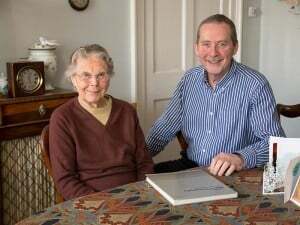 We had exchanged Christmas cards over the past few years but little more, but I wrote to her, explained the situation and asked if she still possessed a copy of Peter’s book. The answer came back very quickly. Yes, she did have just one copy, assigned in Peter’s hand to his son David, with whom I had occasional contact, but that both she and David were very happy for me to have the book. An invitation to visit her followed and I was able to make the journey to her house in Bath, where I had visited a few times before. Jean presented me with the book, under the proviso that I pass it on to a suitable person later in my own life. She also produced a copy of the original London School of Medical Photography Study Guide, in remarkable condition, and gave that to me too. That has given me the impetus to update some of the writing and the exercises in that Guide and I will publish these occasionally on this blog in the hope that they will be helpful to current and future students. I do consider myself very fortunate to have known Peter Hansell and to have been guided and helped by him in my career. His is a name that lives on today – the Royal Photographic Society has a Peter Hansell Scholarship Fund and IMI’s journal, the Journal of Visual Communication in Medicine has a Peter Hansell Award for the best paper, a fitting memory of someone who encouraged all his staff to write papers and further their own knowledge and that of everyone else. I am indebted to colleagues for additional information regarding the earlier photographs of Peter Hansell. Ray Lunnon, (my former Director at what was then The Hospitals for Sick Children, Great Ormond Street) wrote to me and identified Nyfed (Jeff) Jeffries and gave me several new wonderful stories about Peter. I am still reading and digesting the information he has passed on, so will update and add to this post over time. 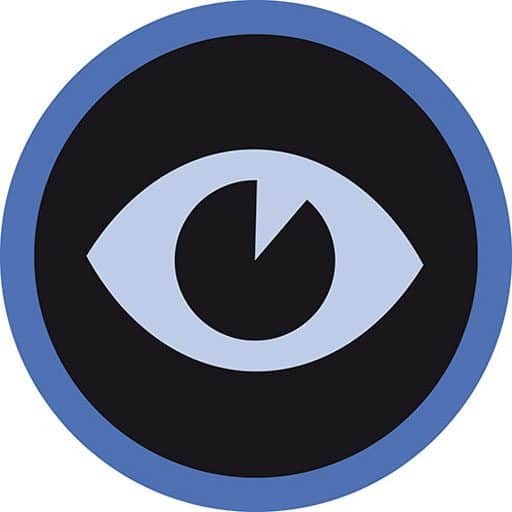 Colleagues in America: Martin Scott, Nick Graver, Tom Hurtgen and Ron Irvine, all Fellows of the Biological Photographic Association Inc. (now the BioCommunications Association) positively identified H. Lou Gibson and Charles G Brownell.